The 737 assembly line in Renton delivered just 34 jets, far short of the 52 per month production rate. In better news, Boeing booked a significant order to start the year, for 18 Dreamliners going to an unidentified customer. Boeing jet deliveries slowed markedly in January. In particular the 737 assembly line in Renton delivered just 34 jets, far short of the 52 per month production rate, partly because of a slowdown in deliveries to China while it’s in trade negotiations with the U.S. Including other jet models, Boeing delivered a total 46 airplanes in January, including eight widebody 787 Dreamliners, again well short of the standard production rate for that model of 12 jets per month. In better news, Boeing booked a significant order to start the year — for 18 Dreamliners going to an unidentified customer. Total orders for the month of 43 aircraft also included 19 P-8 Poseidon maritime military surveillance planes going to the navies of Norway, the U.K. and the U.S.
January is typically a light month both for airplane deliveries and orders. Last week, European rival Airbus reported its activity and fared far worse than Boeing. Airbus delivered just 39 aircraft in January and instead of new orders recorded 13 jet cancellations. The cancellations included eight A380s for Australian carrier Qantas, signaling that the jet maker’s flagship superjumbo airplane program is close to termination. At Boeing, the dearth of 737 deliveries is in part due to supply-chain problems still affecting the new 737 MAX model. At the end of January, Boeing Chairman and Chief Executive Dennis Muilenburg acknowledged continued delays in the supply of engines from CFM for the 737 MAX. Boeing has sent teams of engineers to CFM plants to help overcome the problems. Another issue is that Chinese airlines, which typically take one-third of all 737s produced, have slowed their pace of deliveries, likely awaiting a settlement of the U.S.-China trade and tariff dispute. In January, despite the opening late last year of a new 737 completion center in Zhoushan, Boeing delivered just three 737s to China. 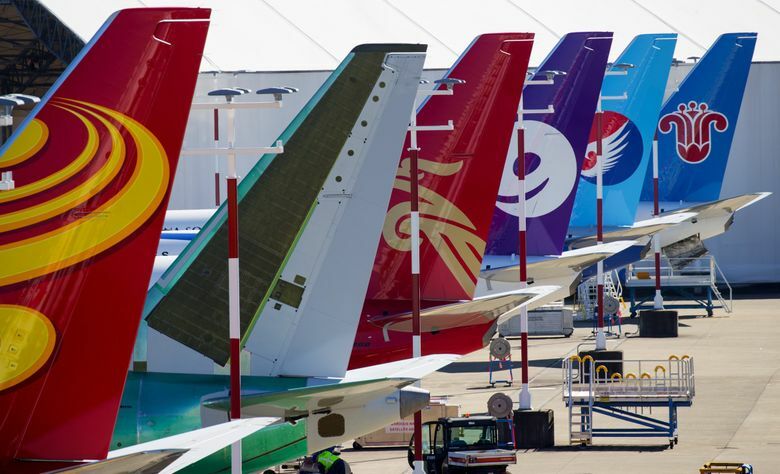 Meanwhile, 737s that appear to be finished and ready to go, painted in the liveries of seven Chinese airlines, sit parked at Boeing Field or Renton. Those include planes for Air China, China Eastern, Donghai, Shandong, Shenzhen, 9 Air and budget carrier China United Airlines. Boeing’s Bergman declined to comment on the lack of deliveries to China. He added that Boeing will “continue to work hard on production system health and recovery” and still plans later this year to ramp up the 737 rate to 57 jets per month.